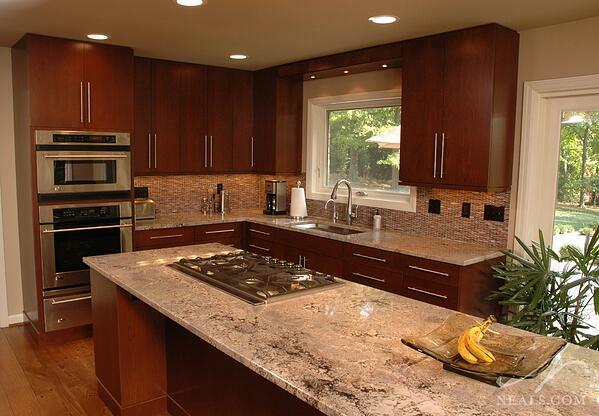 The style of cabinet door used in your kitchen is unquestionably the most important design feature. Door style and color set the tone for the space, and provide the backdrop to the unique elements that make one kitchen different from the next. Cabinet doors, drawer fronts, and appliance panels create the core of the kitchen’s visual look. With all the options for the form and style of the door, color and finish, and extra details, it’s easy to be overwhelmed. To help you stay on track, we’ve outlined the three key points to consider when selecting cabinet doors that suit you, your home, and your needs. In general, there are 3 types of door styles: raised panel, recessed panel, and slab or flat panel. Each of the three styles brings with it a unique character that can guide a kitchen into a specific design direction, but they all have the ability to conform to the design style you’re going for in their own ways. Raised panel cabinet doors in this Neal’s kitchen are timeless and neutral- a great feature for resale. Raised panel doors convey a traditional style and can easily create a design theme that stands the test of time. The middle section of the door is raised, creating a groove between the door’s frame and the central panel. This groove creates a clear visual rectangle that defines each door and panel, and creates highlights and shadows that bring depth to the cabinetry. The style leans traditional because they harken back to the American colonial era, when raised panel cabinetry in the home was a sign of wealth since they were more costly to make. Shaker-style recessed panel cabinet doors in this kitchen remodel create a neutral backdrop to the colorful backsplash and black counter. 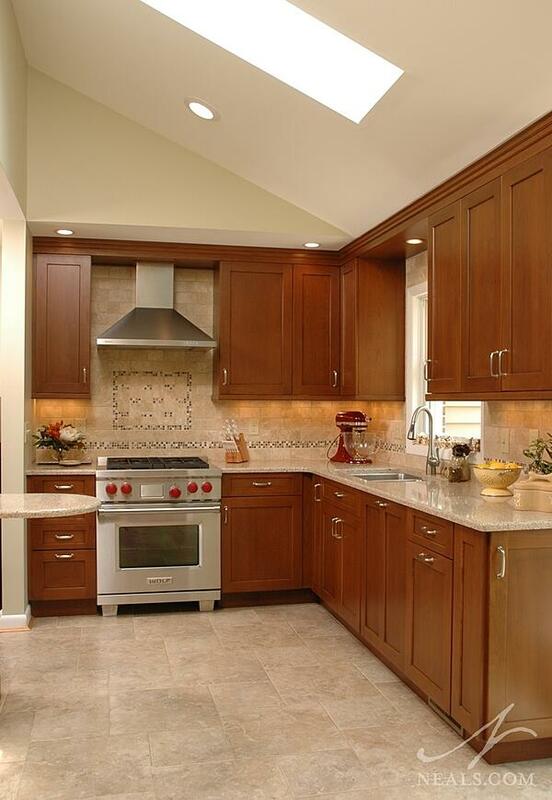 Recessed panel doors, often referred to as “Shaker-style”, are as timeless as they come. Introduced as a cabinetry style at least as far back as the 1700’s, doors with simple raised frames were ubiquitous by the 1930’s, and are still popular today. With a straight-forward design appeal, recessed panel cabinet doors can support a wide range of style details and can go either traditional or contemporary. We like them for this chameleon-like quality, and primarily recommend them for homeowners who are not comfortable committing to a specific style. Combined with chrome door handles, the flat panel doors in this Neal’s kitchen are typical of modern design. Slab doors, those with no frames, grooves or other 3-dimensional detailing, are fairly common in modern kitchen design, and feel instantly contemporary. Color and finish are critical for flat panel doors, as well as how they are paired with hardware. This is because on their own, they have no real style. Slab doors are perfect for homeowners that desire a minimal appearance. Each wood type used for kitchen cabinetry has its own character and features that can dictate whether a stain or a paint is best. Cherry, walnut, maple, and pine, for example, work well with stain because the natural lines and coloration in the panels create depth while still offering consistency. Medium-density fiberboard, or MDF, is quite often used for cabinetry that will be painted because the color will be consistent across the entire surface. Work with your designer to determine which species is the best suited to your needs and budget. Generally speaking, stains will offer a natural selection of tones, though bold color options are available. Stain will allow the natural grain of the wood to show. Paint, however, is opaque and will conceal the grain. 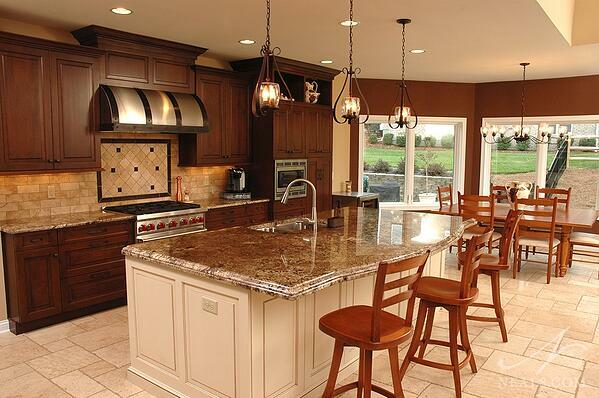 Each cabinetry manufacturer has its own palette of paint options. 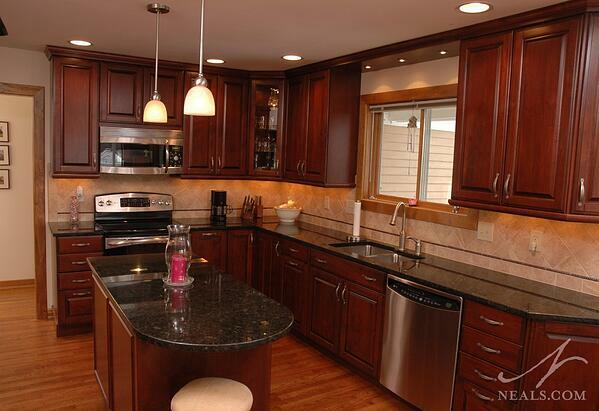 Wood-Mode Cabinetry offers a wide selection of standard paints. The raised panel cabinets in this kitchen remodel were finished in a creamy white to create an airy space without sacrificing its traditional appeal. White finishes in the kitchen have been popular since the 1930’s, when a spotless kitchen was a cultural standard. Whether on a raised, recessed or flat panel door, white is a timeless option, and can be used for almost any design style. This kitchen uses a combination of stained and painted cabinets. Glaze was applied to both finishes to help unify them. Glaze can be added to a stained or painted door to further enhance the color. Glaze is a thin coating with tints of color that not only effects the colors underneath but also pools into grooves and recesses, making them stand out. 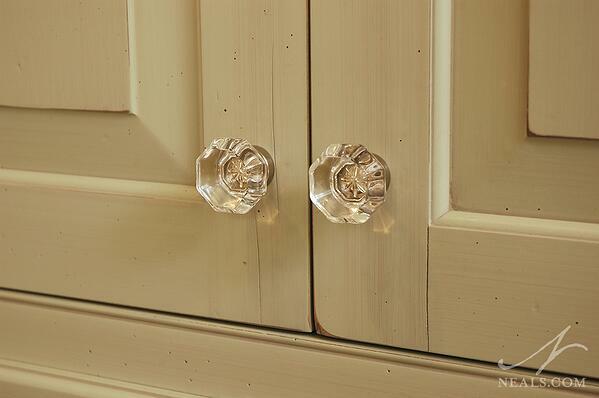 Distressing was applied on these painted kitchen cabinets to give them a more casual, used feel. Vintage applications and distressing are another way to make a cabinet door unique. In vintage or heirloom finishes, the stain or paint application is applied by hand, which creates both variation in how it’s coated as well as the unmistakable lines of a brush mark. Distressing is a careful process that adds a variety of markings and wear to cabinets to prevent them from looking new. This process is especially ideal for traditional or rustic design. Stained and painted cabinetry will show distressing differently. Once the style and finish of the cabinet door are determined by choosing their style and color, the doors can be taken even further by including decorative inserts. Many glass patterns and mullion styles (the spacers between the panels of glass) are available. 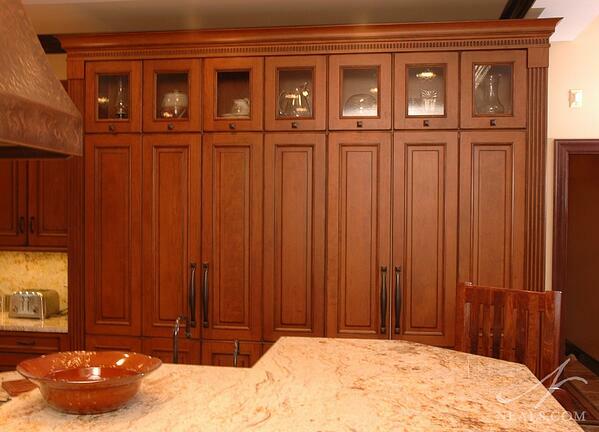 It’s also possible to include rattan, metal, exotic hardwoods, and veneers in the cabinetry. Additional trim and molding applied to the cabinet framing around the door, add another level of detail and customization. Small glass inset doors were used above the fridge and pantry cabinets to display the homeowner’s collection of serve wear and cake stands. Glass can be added to most styles of cabinet, and can be clear, frosted, vintage (with imperfections), or leaded. Including glass in the cabinet scheme can help a large bank of cabinets from feeling to heavy, and offers an ideal spot to display glassware, china or other collectables. 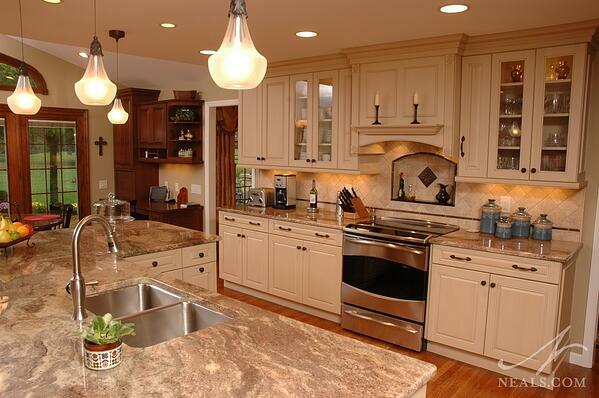 It’s also ideal to include in-cabinet lighting to cabinets with glass fronts to highlight the contents. For more information of kitchen cabinets, check out our post on the 4 Things You Should Know Before Choosing Kitchen Cabinets.